The Hovergrill is a great way to maximize the cooking area on your Weber style kettle grill. Made of solid stainless steel for years of use. 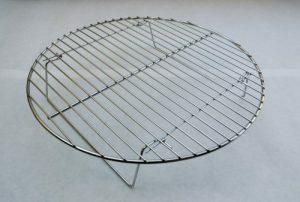 Really good grate… I bought it for actual grilling but used it first smoking a brisket on my Weber Kettle to place it closer to the dome and thus at more regulated temperature and higher smoke concentration… the result was perfection (9 hours, 70 C and then cover with foil, 90 C done). The grill was all black of course, and stained with the brisket juices and fat… but was easily cleaned and once again looks brand new (stainless steel????). I am happy to have bought it, and I haven’t used it grilling ribeyes or actually finishing them with indirect heat and a foil thingy underneath to avoid making my Kettle dirty. This is a great way to nearly double your Weber grill’s smoking capacity! Works perfectly on my Weber Smokey Mountain. Awesome to easily add so much cooking space.